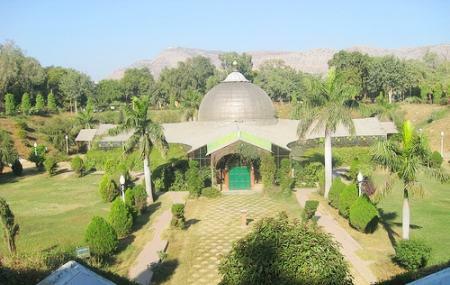 Purjan Vihar is one of the landmark attractions of Alwar. It was initially known as The Company Gardens. Later, Maharaja Jai Singh changed its name to Purjan Vihar. The first stone was laid during the rule of Maharaja Shivdan Singh is 1868 and was at last completed into a large vaulted structure by Maharaja Mangal Singh. The structure was mainly built to prevent the strong sun rays from entering into the garden and escaping from the heat of the deserts. This was named as ‘Shimla House’, which means house of summer. The splendid lush green lawns that relax your eyes. The lawns were created in the 19th century and surprisingly still remain just as beautiful as they were a 100 years back. There are beautiful pathways laid out for you to enjoy the scenery while you take a walk amidst the garden. This place is surely a colorful and fresh treat to the eyes in the middle of the sandy deserts. The beauty of this place strongly attracts the tourists who come to Alwar. The best time to visit is in the early morning to view the mesmerizing sunrise from here. The garden is closed on Monday. Cameras and video cameras are allowed here without any extra charge. The place has a pleasant weather even during the summers due to the Shimla House, which makes way for the cooler air minus the strong rays of the sun. How popular is Purjan Vihar? People normally club together Sariska Tiger Reserve and Jaisamand Lake while planning their visit to Purjan Vihar. Visit only when u need items in large quantities. Otherwise too much rush. You need approx 3 hours to take grocery items. And staff behaviour is also rude type. For liquor it's good maximum 10 min. Waiting. We always see the wrong side of others, we never see their good aspect, because looking at the good aspect we do not have that vision ..